Take a moment away from your computer screen, and give some props to Alan Turing, the code-breaking badass who helped make all this possible. Turing has captured our imagination several times, in books and movies. Here's our potted history of the Father of Computer Science in pop culture. This fantastic novel about artificial intelligence — still one of the best A.I. novels, even after 20 years — includes an A.I. named Turing, who lives inside a library computer. And one of the novel's lovely moments happens when Turing, the A.I., succeeds in passing the Turing Test — convincing someone that it's human. Stephenson's novel includes several real-life characters, but Turing gets a pretty prominent placement, being treated "like a deity, having mythological significance because of the impact his work has had on modern computer science," as the American Mathematical Society wrote when the book came out. We witness first-hand Turing's attempts to create a primitive computer, to decipher Nazi messages, and Turing's idea of "computable" numbers is important. When Stephenson's character Waterhouse goes for a walk, he muses that "the ocean is a Turing machine." The cyber-police in this novel are the Turing Registry Agents. Also in Idoru, there's a discussion of the Turing Test, and whether "sentience" is something to do with embodiment or density of information. This acclaimed Bolivian cyberpunk thriller follows Miguel "Turing" Saenz, a code-breaker who works for a secret government organization called the Black Chamber. He's up against a "cyberhacktivist" who plots revolution. 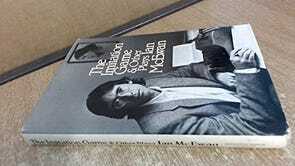 The first sentence goes, "As soon as you turn your back on the uncertain sunrise and enter your office building, you cease to be Miguel Sáenz, the civil servant discernible behind the wrinkled gray suit, round, wire-rimmed glasses, and fearful gaze, and become Turing, decipherer of secrets, relentless pursuer of encoded messages, the pride of the Black Chamber." Published by MIT Press, so you know it's legit. Apparently the hero of this novel is "Turing, an interactive tutoring program and namesake (or virtual emanation?) of Alan Turing, World War II code breaker and father of computer science." Doctor Who, "The Curse of Fenric"
Incidentally, one of the three Turing machines in existence was stolen by someone who called himself the Master, who left coded messages for the police. Turing was a huge fan of Monopoly, so it's fitting that now you can play a version of this classic board game based on his life. This cyberpunk novel includes a super-powerful A.I. that's taken on the guise of Turing, and guards some massively important secrets. Read some sample chapters here. Rucker goes alt-history in this preternaturally loopy book. Quoting from the cover blurb: "What if Alan Turing, founder of the modern computer age, escaped assassination by the secret service to become the lover of Beat author William Burroughs? What if they mutated into giant shapeshifting slugs, fled the FBI, raised Burroughs's wife from the dead, and tweaked the H-bombs of Los Alamos?" A researcher into multi-dimension theory, Peter Tuthy, flees persecution as a homosexual in the U.K., coming to the U.S. And the award-winning story draws parallels and connections between Tuthy and Turing, who was also persecuted for his sexuality. In this novel, a mysterious narrator intertwines the lives of Kurt Gödel and Turing, showing how their illustrious careers and tragic ends mirror each other. Totally missed this one for some reason — thanks to Katje for pointing it up! 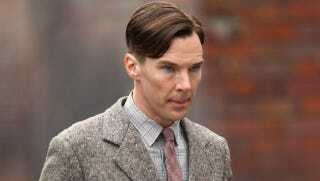 A 2011 BBC documentary/dramatization in which Ed Stoppard plays Turing. This 1980 short play features a cryptographer named Tanner who mentors a young woman who's recruited into the Women's Royal Navy — and McEwan said that he wanted to write a play about Turing, but decided to fictionalize instead. And last but definitely not least, there's Hugh Whitemore's fantastic play, which was adapted for television starring Derek Jacobi — the whole thing is right here, and it's an absolute must watch. Just be prepared to have your heart shredded. And let's give the last word to Moore himself, whose Imitation Game screenplay topped the Blacklist of the best unproduced scripts: "as Turing's legacy lives on, so should his legend."